PATRIARCH ALEXY II (+2008) – Memory Eternal ! Friday December 5 during the mid-morning hours (Moscow time), His Holiness Alexy, Patriarch of Moscow and all Rus' fell asleep in the Lord. His Holiness selflessly served the Church with much love and dedication. He will be missed immensely. His Holiness Patriarchy Alexy II of Moscow and All Russia was the fifteenth Primate of the Russian Orthodox Church since the establishment of the Patriarchal office in Russia (1589). Patriarch Alexy (secular name Alexey Mikhailovich Ridiger) was born on 23 February 1929 in Tallinn, Estonia, into the family of deeply believing people. Patriarch's father Mikhail Alexandrovich Ridiger (+1962), a native of St. Petersburg, studied at the Law College, graduated from the gymnasium while in emigration in Estonia, and in 1940 graduated from the three-year Theological course in Tallinn and was ordained deacon, and then later priest. For sixteen years he was Rector of the Church of the Nativity of the Mother of God in Tallinn, and member and later chairman of the Diocesan Council. His Holiness's mother, Yelena Iosifovna Pisareva (+1959) was born in Revel (now Tallinn). Every year the parents of His Holiness went on a pilgrimage with their son to the Convent of the Holy Dormition in Puhtica and to the Holy Dormition Monastery of the Caves in Pskov. In the late 1930s they made two pilgrimages to the Valaam Monastery of the Transfiguration of our Lord on Lake Ladoga. These pilgrimages largely determined the spiritual way of life of the future Patriarch. From his early childhood Alexey Ridiger served in the church under the guidance of his spiritual father Archpriest Ioann Bogoyavlensky, later Bishop of Tallinn and Estonia (+1949); from 1944 to 1947 was senior subdeacon of Archbishop Pavel (Dmitrievsky) of Tallinn and Estonia (+1946) and later of Bishop Isidor. Alexey Ridiger studied at the Russian secondary school in Tallinn. In 1945 subdeacon Alexey was instructed to prepare the Cathedral of St. Alexander Nevsky in Tallinn for opening so that divine services could be resumed there (the Cathedral was closed during the wartime occupation). From May 1945 to October 1946 he was an altar boy and sacristan of the Cathedral. From 1946 he served as psalm-reader in St. Simeon's Church and from 1947 - in the Church of the Kazan Icon of the Mother of God in Tallinn. He entered the Leningrad (now St. Petersburg) Theological Seminary and graduated from it with honors in 1949. When a student of the Leningrad (now St. Petersburg) Theological Academy, Alexey Ridiger was ordained deacon on 15 April 1950 and priest on 17 April and appointed Rector of the Church of the Epiphany in Johvi, Tallinn diocese. In 1953 Fr. Alexy graduated from the Theological Academy with honors and with the degree of the Candidate of Theology. On 15 July 1957 Fr. Alexy was appointed Rector of the Cathedral of the Dormition in Tallinn and Dean of the Tartu district. On 17 August 1958 he was elevated to the rank of archpriest. On 30 March 1959 he was appointed Dean of the united Tartu-Vilyandis deanery of the Tallinn diocese. On 3 March 1961 he took his monastic vows in the Trinity Cathedral of the Laura of the Holy Trinity and St. Sergius. On 14 August 1961 Hieromonk Alexy was nominated Bishop of Tallinn and Estonia and entrusted with temporary administration of the Riga diocese. On 21 August 1961 Hieromonk Alexy was elevated to the rank of Archimandrite. On 3 September 1961 Archimandrite Alexy was consecrated Bishop of Tallinn and Estonia in the Cathedral of St. Alexander Nevsky in Tallinn. On 14 November 1961 Bishop Alexy was appointed deputy chairman of the Department for External Church Relations of the Moscow Patriarchate. On 23 June 1964 Bishop Alexy was elevated to the rank of Archbishop. On 22 December 1964 Archbishop Alexy was appointed Chancellor of the Moscow Patriarchate and became permanent member of the Holy Synod. He was Chancellor till 20 July 1986. On 7 May 1965 Archbishop Alexy was appointed Chairman of the Education Committee. Archbishop Alexy was a member of the Holy Synod Commission on Christian Unity and Interchurch Relations from 17 October 1963 to 1979. On 25 February 1968 Archbishop Alexy was elevated to the rank of Metropolitan. From 10 March 1970 to 1 September 1986 he supervised the Pensions Committee, the task of which was to provide pensions to the clergy and employees of the church organizations, as well as to their widows and orphans. On 18 June 1971 in consideration of his assiduous work for the carrying out of the Local Council of the Russian Orthodox Church of 1971 Metropolitan Alexy was honored with the right of wearing the second panagia. Metropolitan Alexy performed executive functions as a member of the Commission for the Preparation and Execution of the 50th (1968) and 60th (1978) anniversary of the Revival of the Patriarchal Office in the Russian Orthodox Church, a member of the Holy Synod Commission for the Preparation of the Local Council of the Russian Orthodox Church of 1971, chairman of its Procedural and Organizational Group and chairman of the Secretariat of the Local Council. From 23 December 1980 he was deputy chairman of the Commission for the Preparation and Execution of the Celebration of the Millennium of the Baptism of Russia and chairman of the Organizational Group of the Commission, and chairman of the Theological Group from September 1986. On 25 May 1983 he was appointed chairman of the Executive Commission for the Transfer of the Danilov Monastery, organization and execution of all works for its restoration and construction of the Spiritual and Administrative Centre of the Russian Orthodox Church on its territory. He retained this post till his appointment to the Leningrad (now St. Petersburg) diocese. On 29 June 1986 he was appointed Metropolitan of Leningrad and Novgorod and entrusted with the administration of the Tallinn diocese. 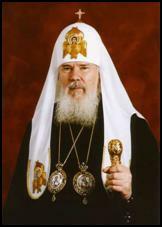 On 7 June 1990 he was elected to the Moscow Patriarchal Throne at the Local Council of the Russian Orthodox Church. The enthronement was held on 10 June 1990. As bishop and metropolitan, His Holiness served on an exhaustive list of delegations of the Russian Orthodox Church to the World Council of Churches (WCC) and international theological discussions with Orthodox, Catholic and Protestant. His Holiness Patriarch Alexy was award honorary doctorate degrees from more than 16 universities, theological academies and seminaries throughout the world. He was awarded the highest award of the Russian Federation - the Order of St. Apostle Andrew the First-Called, Order 'For Services to the Fatherland', many orders of the Local Orthodox Churches, state orders of different countries and awards of public organizations. In 2000 His Holiness the Patriarch was elected an honorary citizen of Moscow. He was an honorary citizen of St. Petersburg, Novgorod the Great, Republic of Mordovia, Republic of Kalmykia, the cities of Sergiev Posad and Dmitrov. It was under Patriarch Alexy's leadership that reconciliation was achieved between the Moscow Patriarchate and the Russian Orthodox Church Outside of Russia [ROCOR]. In May 2007, an Act of Canonical Unity was signed by Patriarch Alexy and His Eminence, Metropolitan Laurus, First Hierarch of ROCOR. The Act brought ROCOR under the omophorion of the Moscow Patriarchate, thus healing 80+ years of separation. Throughout the years of his episcopal ministry Metropolitan Alexy visited many dioceses of the Russian Orthodox Church and many countries of the world, attending many church events. Several hundred of his articles, presentations and works on theological, church and historical, peace and other topics were published in the church and secular press in Russia and abroad. His Holiness Patriarch Alexy headed the Bishops' Councils of 1992, 1994, 1997 and 2000 and has always chaired the sessions of the Holy Synod. As the Patriarch of All Russia he has visited 81 dioceses, many of which several times. Altogether he made 120 visits to the dioceses, primary objective of which was the pastoral care for distant communities, strengthening the unity of the church and bearing Church witness in society. Throughout his episcopal ministry His Holiness Patriarch Alexy presided at 83 episcopal consecrations (more than 70 after his election to the Patriarchal Throne), ordained more than 400 priests and almost an equal number of deacons. His Holiness Patriarch Alexy paid great attention to the training of clergy for the Russian Orthodox Church, to the religious education of laymen and to the spiritual and moral education of the younger generation. By 1995 it was already possible for the Church to re-establish its mission work. His Holiness paid great attention to building new relationship between the State and the Church in Russia. He adhered with conviction to the principle of separation between the mission of the Church and the functions of the state and of non-interference in the affairs of each other. At the same time he believed that the salutary ministry of the Church and the ministry of the state to society demand mutually free cooperation between the church, state and public institutions. After many years of persecution and restriction the Church has regained the opportunity to carry out catechetical and religious-educational activity in society and also to carry out charitable work for the needy, in hospitals, homes for the elderly and prisons. The pastoral approach of His Holiness Patriarch Alexy removed tension caused by unjustified fears and narrow corporate or personal interests between state institutions, responsible for the preservation of the monuments of culture, and the Church. His Holiness has signed several joint documents with the Ministry of Culture of the Russian Federation and with the leadership of several museums located on the territory of the monasteries, which have ecclesiastical, historical and spiritual importance. These agreements resolve the afore-mentioned problems and give new life to the monasteries. His Holiness Patriarch Alexy called for close cooperation among representatives of all spheres of secular and church culture. He was constantly reminding of the necessity to revive morality and spiritual culture, to overcome artificial obstacles between secular and religious cultures and between secular science and religion. A number of joint documents signed by His Holiness have laid a foundation for the development of cooperation of the Church with health and social security systems, the armed forces, law enforcement, justice and culture institutions, and other state structures. A well-organized church system of care for servicemen and personnel of law enforcement bodies was set up with the blessing of His Holiness Patriarch Alexy II. Throughout the period of political, social and economic reforms His Holiness Patriarch Alexy had constantly reminded people of the priority of moral aims over others, of the preference of the ministry to the good of society and concrete people in political and economic activities. His Holiness Patriarch Alexy II of Moscow and All Russia continued the tradition of Christian peace service in the period of social and political crisis in Russia in autumn 1993, fraught with the threat of civil war and undertook the mission of calming political passions by inviting the conflicting parties to negotiations and being a mediator at them. The Patriarch put forward many peace initiatives in connection with the conflict in the Balkans, the Armenian-Azerbaijani confrontation, hostilities in Moldavia, events in the North Caucasus, the situation in the Middle East, military operation against Iraq, etc. Many new dioceses have been established throughout the years of his Patriarchal ministry. The Primate of the Russian Orthodox Church tirelessly worked for the building up of church life and called upon all members of the Church without any exception to participate in it more actively and responsibly on conciliar basis. He paid great attention to the problems of fraternal cooperation among all Orthodox Churches in common witness to the Truth of Christ to the world. His Holiness considered cooperation among different Christian confessions for the sake of meeting the needs of the modern world as a Christian obligation and as a way of fulfilling the commandment of Christ on unity. Peace and accord in society, to which Patriarch Alexy constantly appealed, embrace benevolent mutual understanding and cooperation among the followers of different religions and philosophies of life. May His Memory Be Eternal ! On 9 December 2008, Patriarchal Locum Tenens Metropolitan Kirill of Smolensk and Kaliningrad celebrated the Divine Liturgy together with the assembly of hierarchs and clerics at the Cathedral of Christ the Savior. It was followed by the funeral service for the deceased Primate of the Russian Orthodox Church Patriarch Alexy II of Moscow and All Russia. Paying last respects to His Holiness Patriarch Alexy were delegations of all Local Orthodox Churches. The delegation of the Church of Constantinople was led by His Holiness Patriarch Bartholomew; the Church of Alexandria by Metropolitan Peter of Aksum; the Church of Antioch by Bishop Nifon of Philippopilis, representative of the Patriarch of Great Antioch and All the East in Moscow; the Church of Jerusalem by Metropolitan Hesychios of Kapitolias; the Georgian Church by His Holiness and Beatitude Patriarch-Catholicos of All Georgia Iliya II; the Serbian Church by Metropolitan Amfilohiy of Crna Gora and Primorje, chairman of the Holy Synod; the Romanian Church by His Beatitude Patriarch of Romania Daniel; the Bulgarian Church by Metropolitan Dometian of Vidin; the Church of Cyprus by Metropolitan Georgios of Paphos; the Church of Greece by His Beatitude Hieronymos of Athens and All Greece; the Church of Albania by His Beatitude Archbishop Anastasios of Tirana and All Albania; the Church of Poland by Archbishop Szymon of Lodz and Poznan; the Church of the Czech Lands and Slovakia by His Beatitude Metropolitan Christopher of the Czech Lands and Slovakia; the Orthodox Church in America by Archbishop Seraphim of Ottawa and Canada. Russian President D. Medvedev and Russian Prime-Minister V. Putin arrived in the Cathedral of Christ the Savior for the funeral service. Attending the service were members of the Russian government, the State Duma deputies, members of the Russian Federation Council, other statesmen and leaders of the regions. Also attending the funeral service to bid farewell to His Holiness Patriarch Alexy of Moscow and All Russia were President of Belarus A. Lukashenko, President of Moldova V. Voronin, President of Serbia Boris Tadic, President of Armenia Serge Sarkisian, Ambassadors of the USA, the Great Britain, France, Canada, Japan, Switzerland, Italy, Spain, Greece and other countries, as well as representatives of the governmental, public and religious organizations from Russia and other countries. The funeral service for the late Primate of the Russian Orthodox Church was celebrated by His Holiness Patriarch Bartholomew of Constantinople and the Patriarchal Locum Tenens of the Moscow Patriarchal Throne Metropolitan Kirill of Smolensk and Kaliningrad together with the Primates and representatives of the Local Orthodox Churches, members of the Holy Synod, and other archpastors of the Moscow Patriarchate. The prayer of absolution was read in the end of the service, and those present gave their last kiss to the Primate of the Russian Orthodox Church at the place of his repose at the Cathedral of the Epiphany in Yelokhovo. 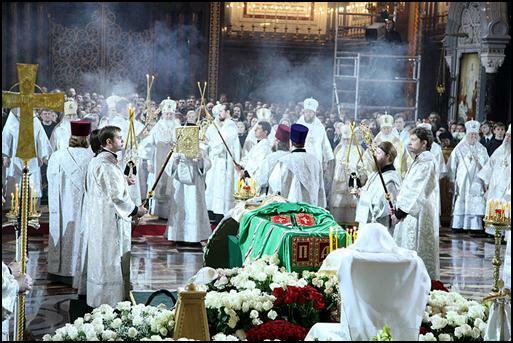 On 9 December 2008 after the Divine Liturgy, His Holiness Patriarch Bartholomew of Constantinople and the Locum Tenens of the Moscow Patriarchal Throne Metropolitan Kirill of Smolensk and Kaliningrad celebrated the funeral service for His Holiness Patriarch Alexy II of Moscow and All Russia at the Cathedral of Christ the Savior in Moscow. Concelebrating were Primates and representatives of the Local Orthodox Churches. 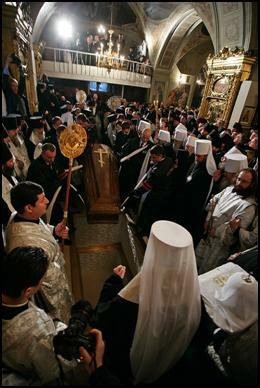 The coffin of the late Primate of the Russian Orthodox Church was carried around the Cathedral after the service. The coffin of the newly deceased His Holiness Patriarch Alexy was taken to the Cathedral Church of the Epiphany in Yelokhovo. The Cathedral of Christ the Savior bid its farewell to His Holiness with funeral bell-ringing. The bells were chiming in other churches of Moscow along the route of the funeral procession. Many people were standing in the streets to greet their Patriarch for the last time. In compliance with the last will and testament of His Holiness Patriarch Alexy of Moscow and All Russia, the Holy Synod resolved to bury the Primate of the Russian Orthodox Church in the Cathedral of the Epiphany in Yelokhovo. The sepulchral vault was constructed at the Annunciation side-altar. Patriarchal Locum Tenens Metropolitan Kirill celebrated the funeral litiya at the coffin of His Holiness before his burial. Praying at the service were hierarchs of the Russian Orthodox Church, and Primates and representatives of the Local Orthodox Churches. 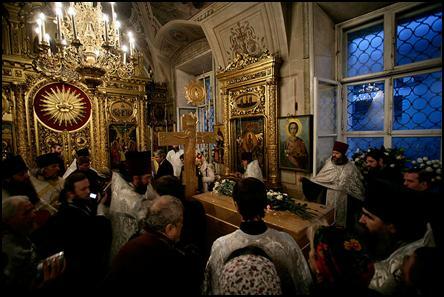 The coffin of the newly deceased Primate of the Russian Orthodox Church was buried with the singing of the Trisagion.